The good news? 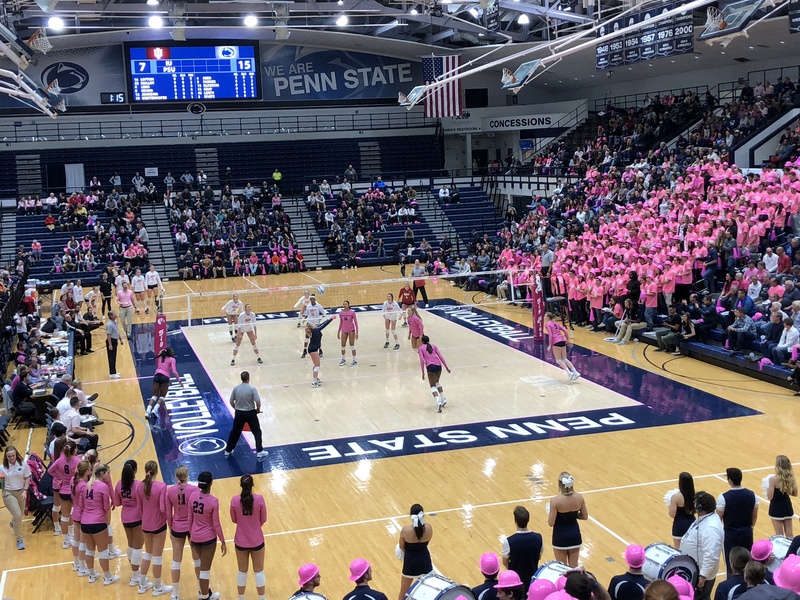 Penn State defeated Minnesota this afternoon 3-1 (25-19, 19-25, 26-24, 25-20) for its third victory over the Golden Gophers this season, which allows them to move on to the Final Four in Louisville next Thursday. The bad news? They’ll be facing an extremely talented and very hot Oregon team, which bounced back from an opening set 25-15 loss to Nebraska to win the next three sets and a Semifinal match against the Nittany Lions. 6-4 Jr. Opp/RS Ariel Scott had a monster match, totaling 25 kills (.422 attack %), followed by 6-1 Jr. OH Deja McClendon with 14 kills (and 7 blocks, including 4 – yes 4! – solo blocks). 6-2 Fr. OH Megan Courtney had 11. 5-6 So. L Dominique Gonzalez (who gets our vote for the Unsung Hero award this season) registered 20 digs, 5-11 So. S Micha Hancock chipped in 13, McClendon had 12 and Courtney contributed 10. Hancock’s 46 assists paced the Nittany Lions to a .237 attack % (Penn State limited Minnesota to .177 hitting). She also totaled 5 very timely service aces (which gave her 22 for the NCAA Tournament — breaking the all-time NCAA Record for aces in NCAA tournament play). 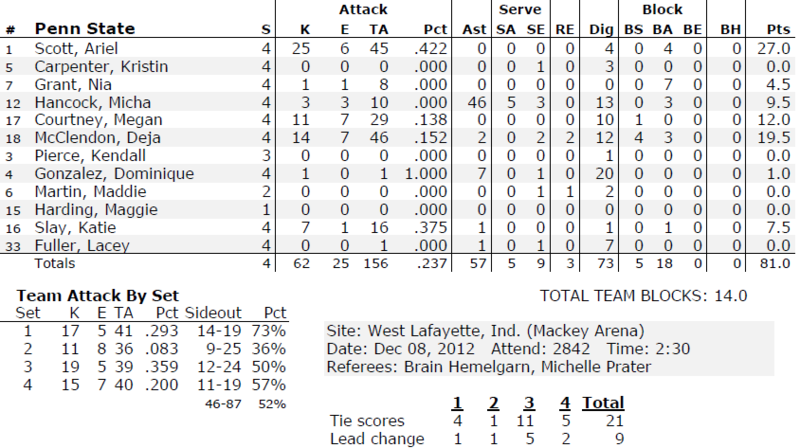 6-2 o. MH Nia Grant registered 7 blocks.